"Brown sauce" was thrown from a car window and splattered another vehicle in what police are treating as a racially aggravated crime. 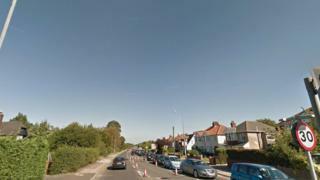 The victim was driving on Woodbridge Road East in Ipswich when a black Vauxhall Corsa drew alongside and threw something from the window, police said. The substance, believed to be brown sauce, went on the door and dashboard. Suffolk Police believes the incident was racially aggravated as the victim was wearing a headscarf at the time. Witnesses into the incident, which happened on Saturday between 17:30 and 17:45 BST, are being sought.